The fifth of the Weston Master series, this meter was made only in the UK, starting in 1963 and continuing to 1972. Model S461 in the UK and 748 in the US. It is very similar to the EuroMaster (Europea in the US) which followed it. Aluminium with a beige-gray plastic case, they were not readily available in the US and not widely sold in the UK so fully working models command a good price on Ebay. The old scales foot-candle (lumen) scale was replaced by an arbitary 2-10 and 10-16 scale. ASA to 16000 (DIN to 42), f1-32, 90 sec - 1/1200 and arbitary scale numbers of 2-10 and 10-16. 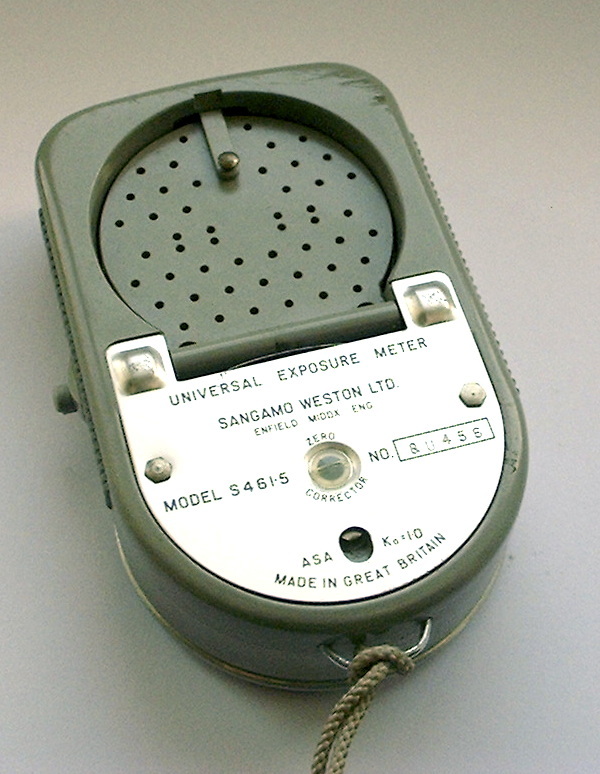 Models exported to the US have a Weston Instruments and Electronics branding although later models show Weston Instruments Inc after the takeover of Daystrom by Schlumberger. The nice very useful slide needle lock of the Weston IV is replaced by a stupid fiddly tiny button which was retained on later models and it the main reason I kept using my IV. The meter shown here has never been unpacked let alone used and works perfectly. It cost me £10!